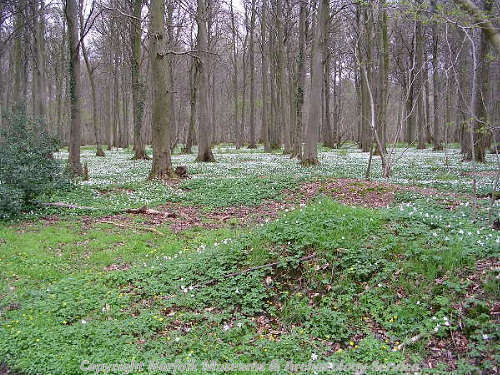 A large ancient wood containing medieval to post medieval earthwork banks and a medieval moated site, see NHER 7307. 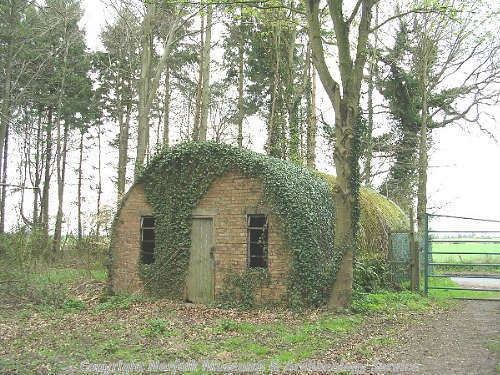 During World War Two the wood was used by the RAF as an ammunition depot, and a network of concrete roads, buildings, bomb stores and water tanks survive within the wood. 'Ancient woodland' containing moated site NHER 7307. Extensive remains of World War Two activity, including concrete tracks, buildings, ammunition dispersals and water tanks. See 1946 APs and papers in file. D. Gurney (NLA), 15 April 2003. There are also earthwork banks that appear to be earlier woodland boundaries or divisions. The wood is notable for the occurrence of small-leaved lime. E. Rose (NLA), 15 April 2004. See contemporary (1942) plan (S1) in file, showing detailed site layout. D. Gurney (NLA), 2 February 2004. According to one of the workers in the wood the various tracks were named after London streets e.g. The Mall. This information originally came from someone who had been stationed in the wood during WW2. D. Gurney (NLA), 8 December 2008. 2007. UEA Landscape III course survey project (S2). Details to follow. The site has been identified as a Forward Ammunition Depot under the command of No. 231 Maintenance Unit that was primarily designed to store and supply bombs to 2 Group Bomber Command in Norfolk. Constructed in the latter half of 1942, it was designed as a response to an increasing shortfall in the amount of bombs required to continue the air war over Axis controlled Europe. See site map in file. D. Gurney (NLA), 6 April 2009. S. Howard (NLA), 7 May 2010. --- Aerial Photograph: RAF. 1946. TG 0714A-B. <S1> Map: Air Ministry Works Directorate. 1942. Hockering, Layout of Forward Ammunition Dump..
<S2> Article in serial: Swingler, B. (UEA Landscape Group). 2008. Danger Area: The Archaeology of Second World War Bomb Dumps in Hockering Wood, Norfolk.. The Prospect. Issue 7, Spring 2008.